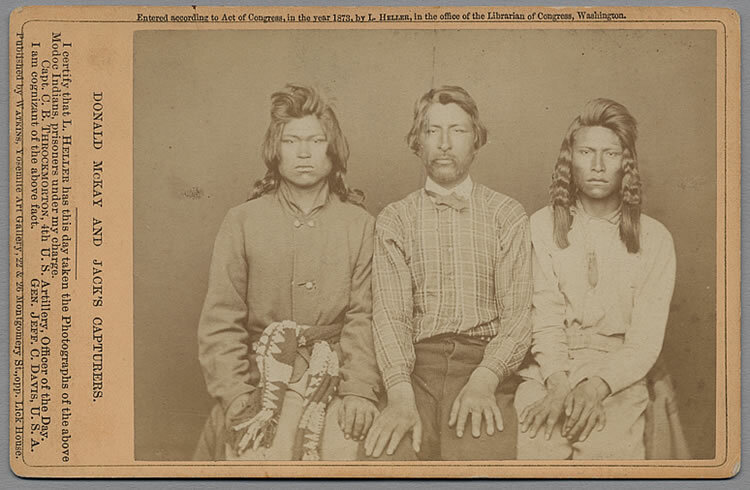 In this photo there's Donald McKay and two others Indians, Captain Jack's capturers. I think that these two men are Warm Springs, but one of my friend claims that the two warriors are two traitors Modoc. Donald McKay was leader of the Warm Springs' scouts. As a consequence, the other two guys are at right supposed to be Warm Springs, too... am I wrong? the reporter Wallace Atwill wrote: "While I am willing to give the Major all the credit he deserves, I will not permit him or any one but the real captors to have the credit of this capture. Car-pi-o-lu and We-na-shet, two Indians of Warm Spring George's division, Captain of McKay's command, captured the redoubtable chief, and to them he surrendered!". So I think that the two Indians are Car-pi-o-lu and We-na-shet, together to Donald McKay. In the book of Riddle, Winema's son, there's this picture and the caption says: "Donald McKay and two scouts". So I think that these two Indians are not prisoners, but Warm Springs scout. Also I think that their hairdo is a Warm Springs hairdo, not Modoc. I think hairstyle suggests Warm Springs too. In the Fleming and Luskey book on Indian photos, they are identified as Warm Springs men.